Baby Gap clothes, while cute, are not functional when you have a disability and/or a squirmy baby. To the person who created baby clothes without zippers or Velcro: Do you hate me? Have you never seen a squirmy baby? Or a mother whose hands don’t work very well because of her disability? Methinks the answer to all of those questions is: no. I think you are a childless person who simply designs “cute” clothes. That’s fine for some, but can you be considerate and make others that those of us who fit in some or all of those categories not feel inadequate or anxious when attempting—and failing—to change our kids. The worst offender? The Baby Gap. (see photo below). Not only do they not have zippers, they have teeny, tiny buttons. EVERYWHERE—the crotch, the waistline. Even along the shoulders. It’s amazing that a baby hasn’t choked or a mother hasn’t gone off the deep end attempting to clothe her child. The other Gap problem is the jeans. They actually have a button and fly—for infants! Amazing. The other clothiers, I believe are just falling into the snap craze. Carter’s and The Children’s Place—neither have zippers often. When they do, I snap them up, but it’s rare. Target has zippers and I was so excited to find them—until I realized they are top-down zippers and need to be actually put together to zip. Pretty sure I would be able to snap an outfit quicker than I’d be able to zip one of their outfits, and that’s not saying much. I unfortunately didn’t notice this style zipper until I was out with Jameson one day when he peed through his morning outfit. I grabbed my backup outfit—a Target zippie with stripes. How embarrassed was I when I realized I was never going to be able to get it closed properly. I assessed my options: leave him in just a diaper; put the outfit on him, but not zip it; put his wet clothes back on him; or ask for help. Like that’s not embarrassing, but it was the only feasible option. 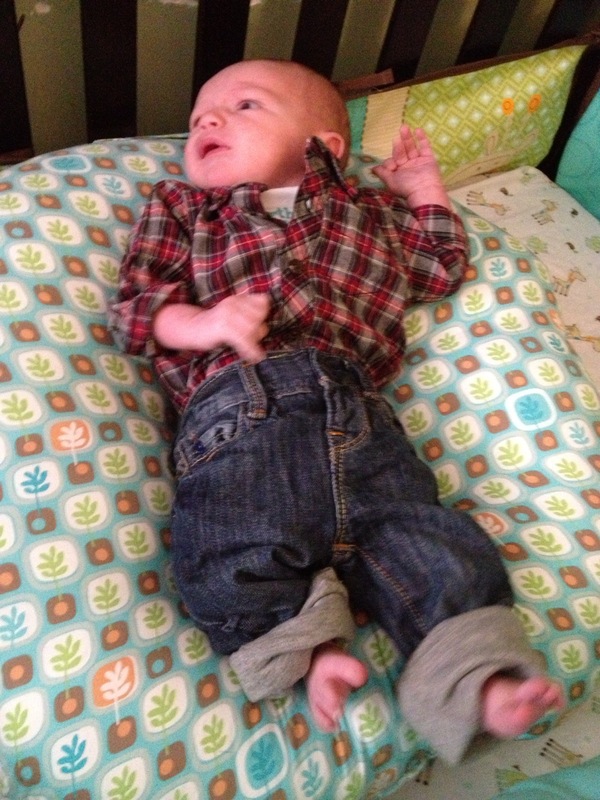 Hi, I’m a mother of a boy and I am not capable of dressing him without my wife here. Can you help? I had some choice words for Target that day, but unfortunately they will never be heard as fashion outweighs form even in infant clothing. The unfortunate thing is that I am limited in what I can dress my own son in. I just wish I had choices. This entry was posted in baby clothes, disabled moms, first time moms, parenting and tagged Baby Gap, Carter's, Clothing, Disabled Mom, Target, Target Corporation, The Children's Place, The Gap, Zipper. Bookmark the permalink.